You may recall that back in August of last year, we talked about Android Control Center by XDA Senior Member Dr.Alexander_Breen. For those who have forgotten, Android Control Center gave Android users something quite similar to iOS 7’s Control Center, but with an Android-centric spin. But in the time since then, Android Control Center has been renamed to Quick Control Panel, and it was essentially rewritten in the process. Just like before, Quick Control Panel is conceptually similar to iOS 7’s Control Center. 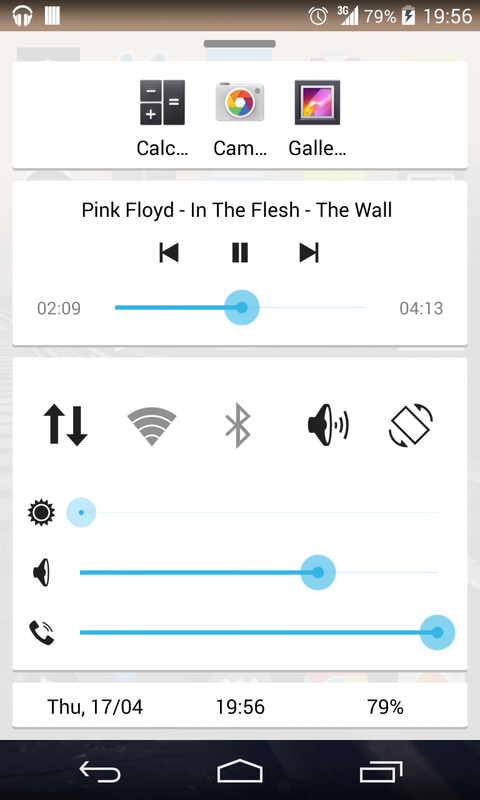 Accordingly, it still allows you to switch various settings on the fly such as power toggles and music playback control–all of which is done with an Android-friendly Holo UI look. Now, however, the application has gained many more functions such as the ability to launch from the lock screen, even more customization, and quick access to the related settings page by long-pressing the toggles. Finally, while the old application was nothing painful to look at, the new revision is even nicer looking, as it features both a Holo UI-like color scheme, along with a cards-style control interface. As was the case with the previous version, Quick Control Panel is available in both premium and lite/free versions. However, the developer has been kind enough to include the full version for free in his thread. However, if you find yourself loving the app, be sure to support the dev with either a donation or by purchasing the paid version. Head over to the application thread to get started.